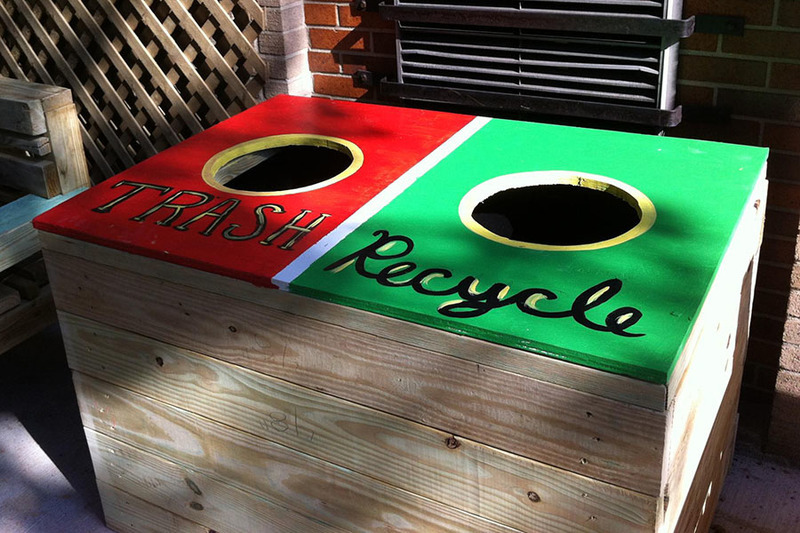 How to Build a Recycle Bin / Trash Bin | KaBOOM! Recycling bins and trash containers help you maintain the playspace by providing places for community members to properly dispose of waste. Bins can be placed inside these containers, making for a much more attractive receptacle. The availability of recycling units can also increase the consideration of the environment and empowers playspace users to put green ideas into practice. Take  of the 2x6x8' boards. Cut each into  48" lengths, for a total of  2x6x48" pieces. Take  of the remaining 2x6x8' boards. Cut each into  30" lengths, for a total of  2x6x30" pieces. Take the remaining 2x6x8. Cut into  2x6x30" piece and  2x6x33" pieces. Take the 4x4x10' board. Cut into  4x4x27 ½" pieces. Take the 4x8' plywood piece. Using the chalk line to mark the wood, cut from one 48"x33" plywood piece with the circular saw. Take  of the 2x6x48" pieces that were previously cut. 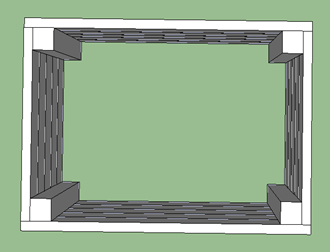 Using the miter saw, cut a 45° angle off of both ends, creating  2x6x48" trapezoids. Take the  2x6x33" pieces that were previously cut. 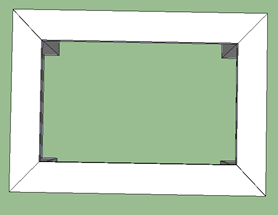 Using the miter saw, cut a 45° angle off of both ends, creating  2x6x33" trapezoids. Take the 48"x33" plywood piece previously cut. Mark two circles on it – each one 12" in diameter, with their centers situated 12" from the 33" side of the plywood and 16 ½" from the 48" side of the plywood. Using the drill and hole saw attachment, drill out both 12" holes in the plywood. 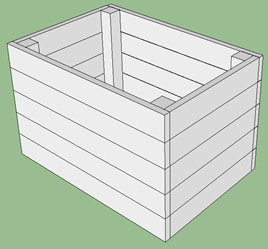 If the lid to the trash and recycling container will be painted, prime all edges and sides once the cuts are finished. 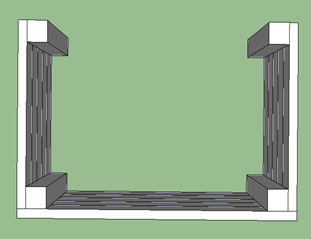 Start by attaching five of the 2x6x30" boards to two of the 4x4x27 ½" using the 2 ½" deck screws. Be sure the outside edges of the 2x6s are flush with the outside edges of the 4x4s. Also be sure the bottom and top of the 4x4s are flush with the outside long edges of the 2x6s. Repeat this process with the remaining two 4x4x27 ½" pieces and the remaining five 2x6x30" boards. 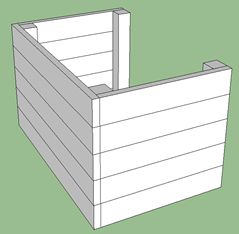 Attach five of your 2x6x48" boards to the sides of the two pieces you previously constructed. Be sure that the 2x6x48" boards come flush with the outside end of the 2x6x30" boards (see pictures below). Repeat this process with your remaining five 2x6x48" pieces on the other side. You should be left with a box. 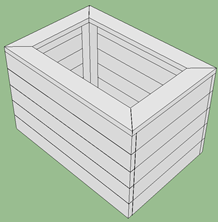 Next attach your four trapezoid boards (two are 2x6x48" and two are 2x6x33") to the top of the box. Be sure you are screwing through the trapezoids into the 2x6s and the 4x4s. 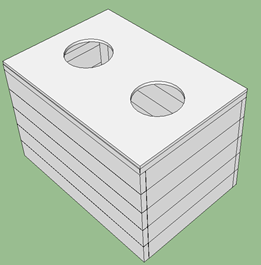 Lastly, you will attach the hinges to one of the long edges of your box and the plywood cover to this side. 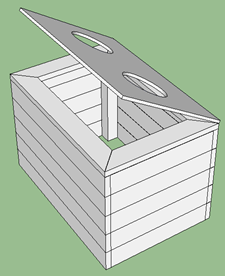 If the lid will be painted, do so once it is fully assembled.